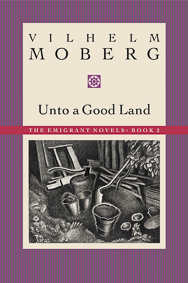 Vilhelm Moberg’s four-volume emigrant novels have been reissued in conjunction with the 150th anniversary of the beginning of Swedish mass immigration to North America. This book opens in the summer of 1850 as the sailing ship Charlotta unloads its human cargo–including Karl Oskar and Kristina Nilsson, their children, and a party of other emigrants from Smaland, a province in Sweden–in New York City. Their journey to the Minnesota Territory takes them by riverboat, steam wagon, Great Lakes steamship, and ox cart to Chisago County. There Karl and Kristina claim 160 acres and begin farming. It is a year of struggle, but the kindness of newfound friends–American and Swedish–tempers the difficulties wrought by little cash, scant knowledge of English, and late-summer planting.